Eye makeup remover, a healthy splash of cool water, and rose water = my evening facial cleansing routine. (Taking a cue from the French, I'm now skipping harsh cleansers.) Rose water functions as a very mild natural toner and astringent, it has antibacterial and antiseptic properties, and the scent is wonderful. My skin has been very happy since I started using it. 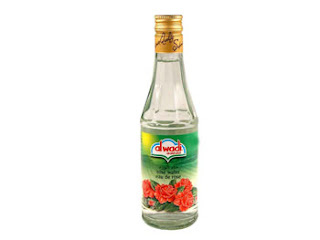 You can find it at any Middle Eastern grocer or order it online for a few dollars a bottle. Just make sure you buy the pure rose water- no additives. I douse a stack of facial cotton pads and store them in an apothecary jar for convenience. I grew up on this stuff! It's also great in tea as a natural sweetener and adds a little something to fruit salads. I usually add a few drops to unripened strawberries.